There are few examples of jukebox musicals that have blown me away. Jersey Boys, which dramatizes the formation, success and eventual break-up of the 1960s rock ‘n’roll group, The Four Seasons, is the only one of import that comes to mind. Ain’t Too Proud: The Life and Times of the Temptations, another jukebox musical, also helmed by the Des McAnuff and Sergio Trujillo duo opened recently at the Imperial Theater on Broadway. No doubt Des and Sergio, and the musical’s 43 producers (all listed in the program) are hoping to duplicate the success of Jersey Boys. Worse! The musical’s thirty one songs, less than a half a handful sung in their entirety, was a two and a half hour musical coitus interruptus.The only satisfying climax came at curtain call when all the super-talented performers, along with the musical’s superb musicians, took their well-earned bows. Yes! A vociferous standing ovation – a Broadway musical tradition for a number of decades – thundered throughout the house. Every person on stage, some playing double roles, some just standing and looking good, could act, dance, and sing to a fare thee well. Adding extra-high voltage were the voices of the lead Temptations. A few could shatter glass and affect sudden and unexpected James Brown splits, all of which had the audience yelling and screaming. 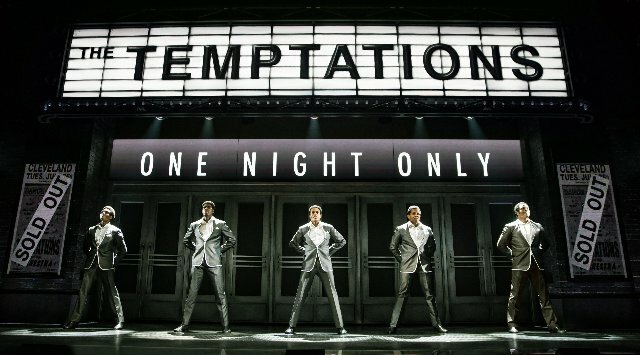 Unlike the Jersey Boys whose format had each of the band members giving their own perspective on the group’s history and music, or The Cher Show, and Summer: The Donna Summer Musical, which featured three Cher’s and three Donna’s, each representing different time period in the star’s life, the Temptations features the group’s original founder Otis Williams (neatly channeled by Derek Baskin) to shepherd us through the history of the group’s six decades. Adding a dollop of historical fluff in minor roles and cameos is Motown’s Barry Gordy (Jahi Kearse), and Smokey Robinson (Christian Thompson). As far as Motown’s female contingent, getting to show their singing chops just a wee bit are the Supremes inhabited by Candice Marie Wood (a superb Diana Ross), Nasia Thomas (Florence Ballard), Taylor Symone Jackson (Mary Wells), and Tammi Terrell (Nasia Thomas), who died of brain cancer at twenty-four. One of the musical’s sadder notes, she gets to share a song with one the Temptations. The highlights of course are the songs sung by the Temptations and a few of their early replacements. Ephraim Sykes as David Ruffin, the group’s second and most famous lead singer sings “My Girl,” and “I Could Never Love Another (After Losing You).” His scissor splits brings down the house. Drug use and irrational behavior helped to do him in. Jawan M. Jackson as Melvin Franklin, with a shaking the rafters’ bass brings needed wit and much laughter as his sonorous voice. Emerging at the proper times his voice sinks lower than is humanly possible. Unfortunately, health issues lay him low. Jeremy Pope’s (Eddie Kendrick) is the always questioning cynic of the group. His high notes during "Just My Imagination (Running Away With Me)" and “Get Ready” pierce the theatre’s ceiling. James Harkness, as Paul Williams, another Classic Fiver, in losing a battle with alcohol commits suicide at 34. His singing "For Once In My Life" with loads of heart-rending emotion is a standout. The last one standing is Derrick Baskin’s Otis Williams who, at 77, is still out there performing with the Temptations. A little known fact, and I am tossing it in for fun, the thrice wed Williams was once engaged to Patti LaBelle. She ended the engagement when he wanted her to quit music and become a housewife. You Go Patti! 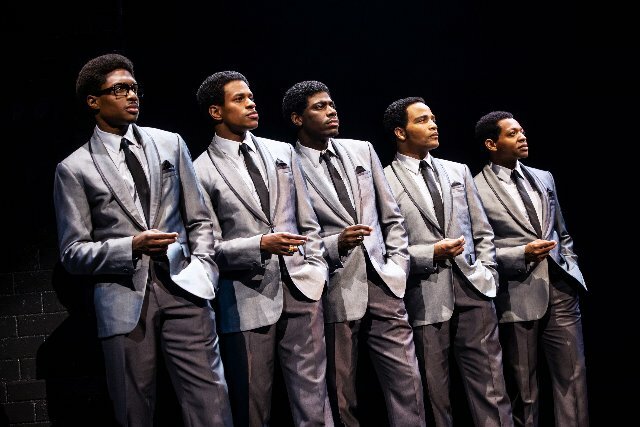 As far as the production’s technical prowess, Paul Tazewell’s costume design, the spiffy signature looking suits of the Temptation’s was letter perfect. The set (Robert Brill) with its revolving turntable, simple furniture when needed, and muted gray colors, and Howard Binkley’s lighting design, did no harm to the production. As far as Sergio Trujillo’s choreography, well, his hands were tied from the git-go. After the first half dozen beautiful and smoothly choreographed songs, and there were some two dozen and a half, tedium began to set in. I mean how many uniquely different hands, legs, and body movement’s can you stomach before you go bonkers.